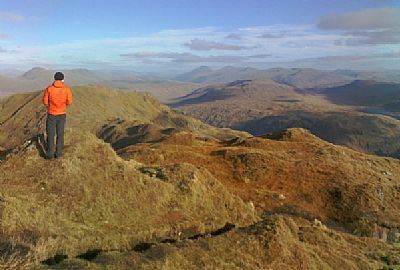 Since my 20s I dreaded the long walk out from climbing mountains such as Beinn Bhuidhe Argyll. My hip joints and lower back would be sore and it would take quite a few days to recover. In my 30s I rediscovered my love of trail running but – just as it had with long walks – my thighs, hips and lower back would start to get sore and I would become injured. I did the usual thing and blamed my age and my shoes, bought expensive new trainers but still no joy. I loved walking and running but I wasn’t a very happy walker or runner. Why did I reach a certain level of fitness and then get injured, only then to have to take a few months off and have to start all over again with building up my fitness levels? Then I discovered Chi Walking (originally through doing a Chi Running workshop) and honestly, it changed everything. Who knew that my posture was so lousy, that my long, slow, heel-striking gait and side-to-side hip movement (I wasn’t even aware that I sashayed!) was playing havoc with my muscles, ligaments and joints. My body was trying to tell me something but I wasn’t listening. I have been Chi Walking and Chi Running now for the past four years or so. I may not be the fastest walker or runner but I am most definitely a happier walker and runner. I no longer have back and hip pain and, if I remember to do my stretches after a long day on the hill, I have no aches and pains!! I, finally, have learnt to listen to my body. But why should someone learn how to walk properly? Surely being able to walk is something we all do naturally? Well, yes and no. Up to about the age of five we all generally walk well but after that we can start to develop poor postures (through the shoes we wear, the amount of sitting we do, reduced activity etc) and, as a consequence, we develop poor standing and walking postures. This, in turn, means walking can start to hurt. Before you know it you have stopped walking those mountains you love so much, cut down on the length of walks with friends or stopped walking altogether. Scientific research shows that walking is good for us on so many levels (physical and mental) and we are all being encouraged to ‘actively’ walk 10,000 steps a day or 20 minutes a day, depending on what you read. But what do you do if your walking has started hurting? Much of what Thich Nhat Hanh says is at the heart of Chi Walking i.e. choosing to walk differently (number four of the Five Mindful Steps in Chi Walking) and walking mindfully with body awareness and understanding. Chi Walking can benefit all sorts of different people whatever their level of fitness or type of walking, be it the daily dog walk, ambles with friends or hill walking. It combines the wisdom found in age-old practices such as yoga and T’ai Chi together with biomechanics and physics and, therefore, there is something in it for anyone, whether you are a yoga convert or feel more comfortable with scientific fact. In essence, it makes sense whatever walk of life you are from (excuse the pun) and it offers a menu of different types of walking from slow walking meditation to fast-paced aerobic and cardio walking. How is Chi Walking different? examine your existing walking style and discover how an aligned, balanced and relaxed body, coupled with a shorter stride length in front, can reduce overall stress and tension leading to longer, stronger, happier walking. Chi Walking is a whole body, holistic approach to walking and is just one tool in the box to feel how our body works both standing and in motion. Different people like different things. Over the years I have been particularly drawn to Kundalini Yoga and find it complements many of the principles we find in Chi Walking (alignment and relaxation, body sensing, gradual progression and increasing energy). Recently I have discovered Restorative Exercise and have found it incredibly useful in creating deeper awareness and understanding of body alignment, biomechanics and my own body with its little foibles. In Chi Walking, we look at alignment and how to balance our postures, we learn about foot placement and how to walk lightly. Practices such as Restorative Exercise take it further and help us understand how the feet talk to the lower legs, which in turn talk to the upper legs and so on and so on. I have always wondered why I manage to wear through waterproof trousers (at the inner knee and inner thigh) every six months. Was it because of the quality of the trousers? Was it because I needed to lose a few kilograms? Well, maybe, but as I now have discovered I have a tendency to stand (and walk) with my feet too close together. Could this be the answer to my waterproof dilemma? On a serious note though, by being conscious of what my body is doing and how, in turn, it is affecting the rest of my body, Chi Walking – together with practices such as yoga and Restorative Exercise – has made me more mindful of how I stand and walk and it is making a big difference.